* Mariell's designer bridal earrings are 1 1/8" h x 7/16" w with brilliant CZ pears set in blush rose gold surrounded by sparkling Cubic Zirconia pave frames. * This versatile new design's timeless beauty is sure to be a favorite for bridal or evening wear. 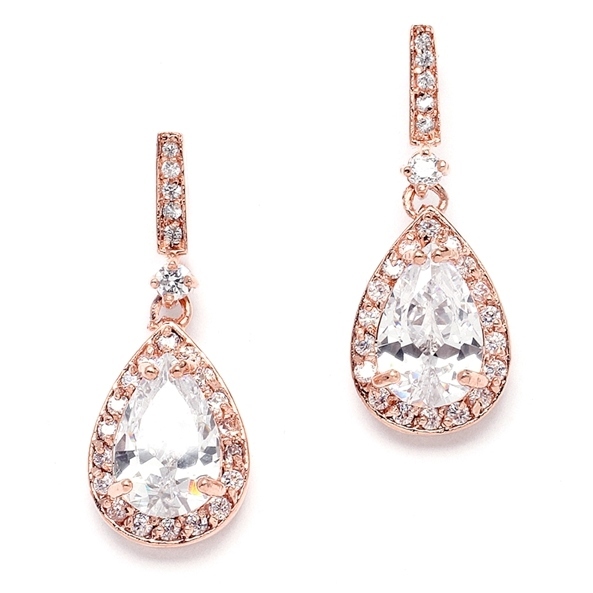 * These exclusive Mariell designer earrings feature top quality Cubic Zirconia faceted pears that are framed with pave CZ and plated in rose gold. * This new design wedding earrings are a chic yet affordable addition to our collection of top selling bridal earrings at a low wholesale price. * With pink blush gold jewelry in high demand, be sure keep these popular earrings in stock.